Our experience in engineering innovation spans more than a century, and our dedication to creating superior products and services continues to evolve. Whether you're looking for specialized material handling equipment, thermal processing equipment or other industry-related services, Heyl & Patterson can help your business succeed. 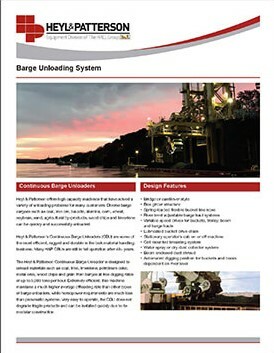 Please fill out the form to the right, and you will automatically be sent an email that contains a link to our Barge Unloaders brochure. Click on the link to open the brochure as a PDF that you can save and/or print.